john4jack (Corvallis, Oregon, United States) on 30 September 2009 in Sport & Recreation and Portfolio. GOOD NEWS - Nikon fixed my 24-70mm lens on the second go around and overnighted it back to me (got it yesterday). While they had it, they cleaned it and checked it out with their sophisticated equipment. It's probably better now than when I bought it. very great capture and colors!!!!!! A wonderful series. We all definitely got our enjoyment's worth out of your fortuitous hour of shooting !!! That is what stands out for me. @Dulcie: Thanks, Dulcie. I would say that the clarity was due to the lens. 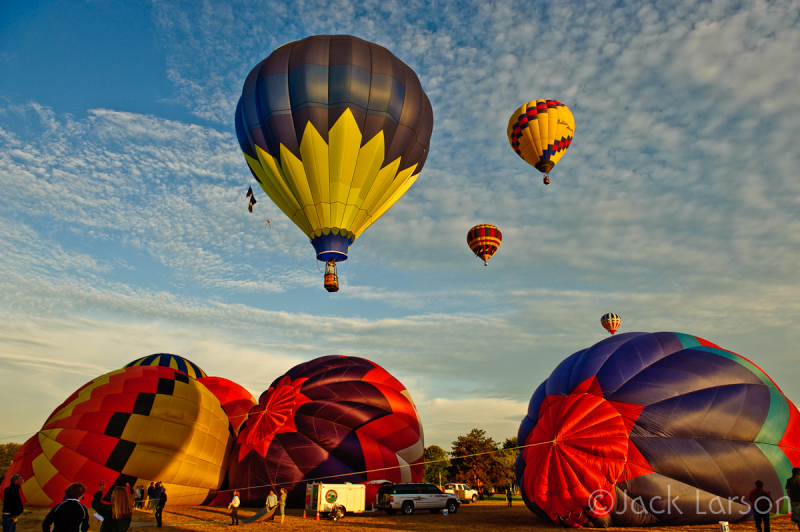 And that the color was due to a combination of the brilliant color of the balloons, the early morning light and the Nikon D700. A riot of brilliant color and a wonderful sky...well done Jack! I am breathless. Awesome series. This is just amazing.... Great Shot. Just Brilliant. Beautiful shot!!! I love the colours. Thanks for sharing this series - I really enjoyed it. Great perspective, colours and composition as usual. Marvelous series. Each one bursting with color. I like how the balloons have such a 3D appearance in the air of this shot. Incredible processing on all of these. Well done, Jack. A wonderful picture to end that serie. Wonderful light! @akarui: Thank you. The light was indeed phenomenal. A wonderful finale and a very well-spent hour with your camera!!! What a success this series has been - simply splendid. I'll bet all those who attended the show would love to see these shots!! You aquired a lot of beautiful shots with that hour and this one is no exception. Wonderful series Jack. amazing colors and scene... beautifully captured!! A fantastic ending of this vibrant and colorful series and you were really lucky with the weather circumstances, because that beautiful sky brings out those colors really well. @Monique: Thanks. You are absolutely right about the weather. The next two mornings of the Air Show were not nearly as nice. It's been a fine series of spectacular pictures. Exceptionally well done! wow, great series, and great colours! J'adore ces couleurs et cette magnifique lumière! Très belle image Jack! Another great shot and a wonderful series. An hour well spent! Another wonderful composition. I can't imagine how you'd have waited for the balloons to be rightly position before clicking the camera. Very very heart-opening serie* Merci ! Comment ne pas aimer cette image..... superbe, bravo. simply amazing! i have no words to describe how much i like it! i like the sensation of fantasy that gives the clouds and the reality that transmit the people on the ground. @bluechameleon: Thank you for your kind words, Sharon. @Steven: Nope. Just took a slew of pictures. The balloon shots have all been awesome! Great colors, great use of the light, great composition! Thanks for sharing them all! @Jen: It was a magical hour. In fact, I didn't realize how magical until I downloaded everything. I have just LOVED this entire series.......You did a phenomenal job.....and now that you've realized you didn't get a shot of all of them in the air, it'll give you something to look forward to, to make sure you catch that shot next time!!! @susan: Thanks, Susan. To be honest, I don't think that there is a shot to be had of all of them, but one could certainly get more of them. I've loved this series. So much color and great shapes! @willow: Thank you. I am just about colored out! Another beautiful shot... Jack, sorry this series is over, but on to other shots now, eh? Even though you didn't get a shot of 40 balloons at once, we get the idea, a wonderful series. Every time I think I've seen the best of the series you post a better one. Incredible. Wonderful series! Very well done. More fabulous colors and shapes! bravo pour cette scène pleine de vie, de couleurs, et de lumière, c'est superbe. This was one of my favourite series here on AM3 - spectacular! @Magda: Thanks; it was a super hour. The sky and the colors are splendid.bravo ! Wonderful colours and light ! Great shot ! Great series !! @Mici: Nikon 24-70mm f/2.8; it is a superb lens.